Description: Color postcard shows young women twisting string around the stalks of young shade grown tobacco. 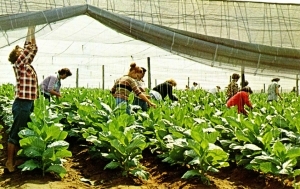 In the Connecticut River Valley leaf tobacco used for cigar wrappers is grown under shade netting. Tying the stalks to the overhead wires reduces damage from wind and rain.